Since I've become a mother, each month to keep myself from going crazy I decided to treat myself to one new nail polish. This has turned out to be a fantastic idea, not only have I treated myself, I've found It quite a speedy, fun and cheap way to build my nail polish collection. I've also discovered that PINK is my colour, something I would never have even entertained before I started this little treat-trend. Anyone whose close to me will tell you, DO NOT GET HOLLY PINK! She hates it! I still do, that's why I was slightly thankful we ended up having a boy for our first instead of a girl. I was dreading the whole pink princess theme, I know, funny for someone whose so into something girly like makeup! Anyway, if my son will let me finish this post, as he keeps waking from his nap for my attention, I've found one of my favourite budget nail polish brands. L.A. Colors Color Craze Nail Polish. I've mentioned these in a past video (I'll put the link below). They are £1 at Right Medicine Pharmacy and last a long time! The colour goes on smooth and can be built up with layers to make the nail bolder. The drying time is quicker than most nail polishes but not the quickest drying nail polish I own but if you manage to dry your nails without accidentally rubbing them the colour is worth the short wait. As for chip resistance, the colour should last for at least half a week permitting you yourself having picked at them while filling in paperwork or talking on the phone etc. But if you're anything like me, by the forth day you're probably itching to apply a different colour anyway. Transformer - A deep red that almost looks like something a vampire would drink. Tropical Breeze - A purple from an exotic island flower, that has an almost matte like look to it. 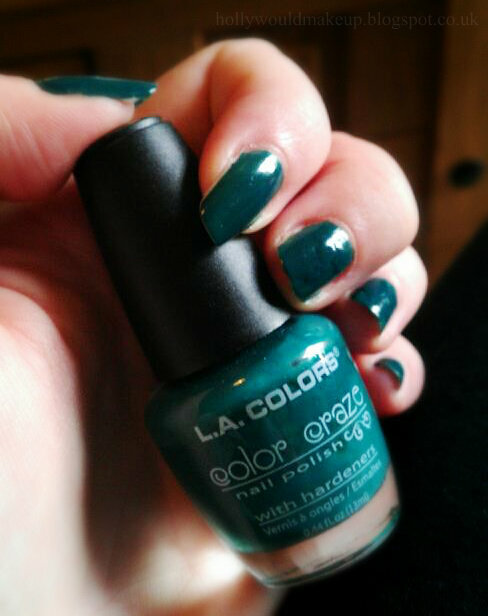 Jungle Fever - The best Autumn green you will ever own! I dare you to get this one, great for outfits that have mustard, black, red, browns, pretty much goes with any other autumn/winter colour or look.